Please share what brand of toothpaste your furkids using. I saw some brand from Japan but cannot read the instruction at all cos all Japanese word. Currently Amos is using Pet Natural but finishing soon. So, i'm planning to find a better toothpaste for him. Re: Which Brand of toothpaste your furkid is using? wait almost another year for what? xmas over dy, u looking for santa, mah need wait end of this year? When did i look for Santa? I'm now using CET by Virbac with Hakao. I have to change the flavors everyday otherwise Hakao won't allow me to brush his teeth. I don't think I saw this brand here before, anybody? jernnie wrote: I'm now using CET by Virbac with Hakao. Where did u get this toothpaste?good or not? 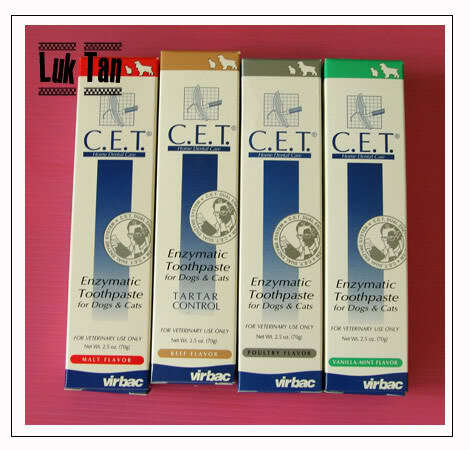 CET toothpastes are available at every big petshops in Thailand. It's very good and Vet here always recommended esp beef flavor. oh can see that beef flavor packaging written "Tartar Control", if i come across this when i shop in bkk then get one and try for my babies.